Professional firms such as law firms need an online presence where potential clients can locate them, learn more about them, and distinguish them from the competition. Articles in their areas of expertise establish credibility and raise internet presence with search engines, with potential clients and with others in the field. Profiles of the principals help put a human face on the firm. A website gives ample space to explain services offered in detail, saving valuable time for both clients and professionals. 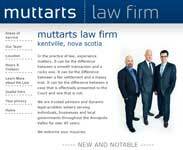 muttarts law firm is a law firm in Kentville, Nova Scotia. 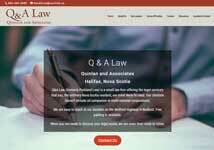 Q & A Law, formerly Parkland Law, is a Halifax, Nova Scotia law firm. 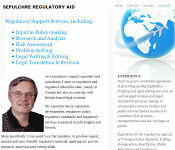 Sepulchre Regulatory Aid provides regulatory support services, including legal editing, research, writing and translation to lawyers, regulated businesses and government. The blog, built on WordPress, serves to highlight to experience, ideas and writing skills of the owner (my husband). 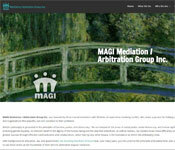 MAGI Mediation / Arbitration Group Inc. was founded by three trained mediators with lifetimes of experience resolving conflict in a variety of settings.